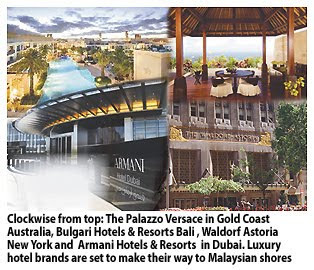 Bulgari, Armani and Versace may no longer be just luxury retail brands found in Malaysian malls, as property developers think about bringing in their hotel brands too. With brands like Grand Hyatt, Mandarin Oriental and Four Seasons already here while St Regis and Raffles have confirmed openings, developers are eyeing fresh and popular hotel brands. "Developers are now beginning to look at Waldorf Astoria and also various designer-linked brands like Bulgari Hotels & Resorts, Palazzo Versace, Armani Hotels & Resorts," vice president of the Malaysian Association of Hotels (MAH) Ivo Nekvapil told Business Times in an interview recently. If these brands make their way to our shores, they are likely to be located either in Kuala Lumpur or on Langkawi island. Nevertheless, Nekvapil feels that sub-brands or brands that come under their more familiar parent company name should be considered as they have potential in Malaysia. These would include brands like All Seasons and Ibis which are Accor brand hotels and Hilton Garden Inn, a Hilton group brand. He explained that these brands have international recognition and as such Malaysia too needs these brands to give the country world recognition. 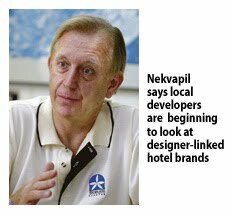 Meanwhile, when asked about the hotel scene in Klang Valley this year, Nekvapil said that there could be an addition of some 2,000 rooms in the four- and five-star hotel/serviced residence category. Additional rooms this year will come from the opening of Somerset Ampang Kuala Lumpur, Best Western KL Sentral, Park Regis Kuala Lumpur and Pullman Kuala Lumpur Bangsar. On occupancy and rates in the Klang Valley, Nekvapil said that 2011 could end with an average room rate (ARR) of RM360 for lower end five-star hotels and about RM500 for higher end five-star category hotels. Occupancy this year could finish at about 68 per cent. Mandarin Oriental still leads the pack, and is now drawing an ARR of around RM700. Last year, occupancy ended at around 65 per cent and ARR of between RM200 to RM320 per night. Malaysia had its highest occupancy of over 70 per cent in 2007.